Sunday, January 24, 2016 we had another successful day of trail restoration. 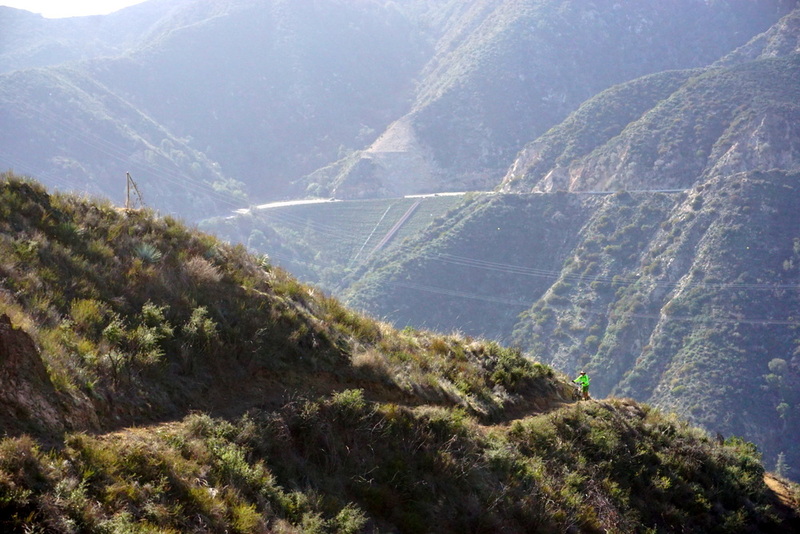 Anyone driving up the Angeles Crest Highway today, who happened to glance across the Arroyo Seco canyon towards Brown Mountain would have seen ten volunteers spread out along the switchbacks, the upper half of which are now clearly visible once again. 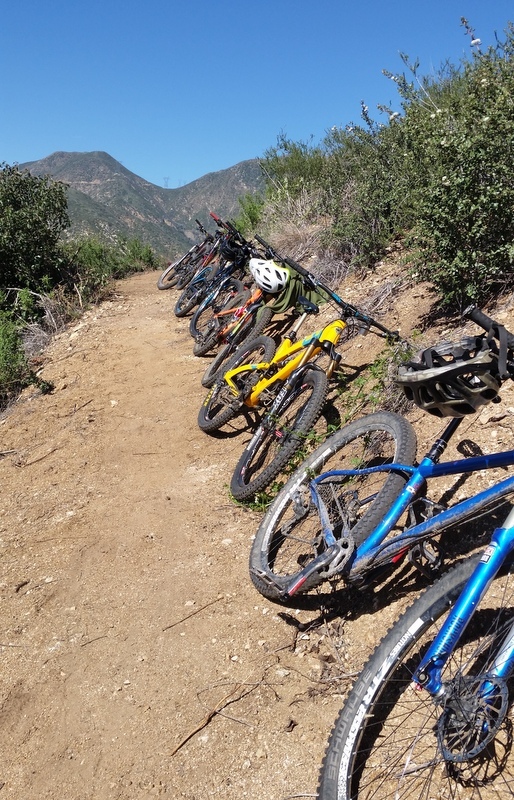 Today we concentrated on brushing the next .25 miles of the trail, which included six switchbacks. 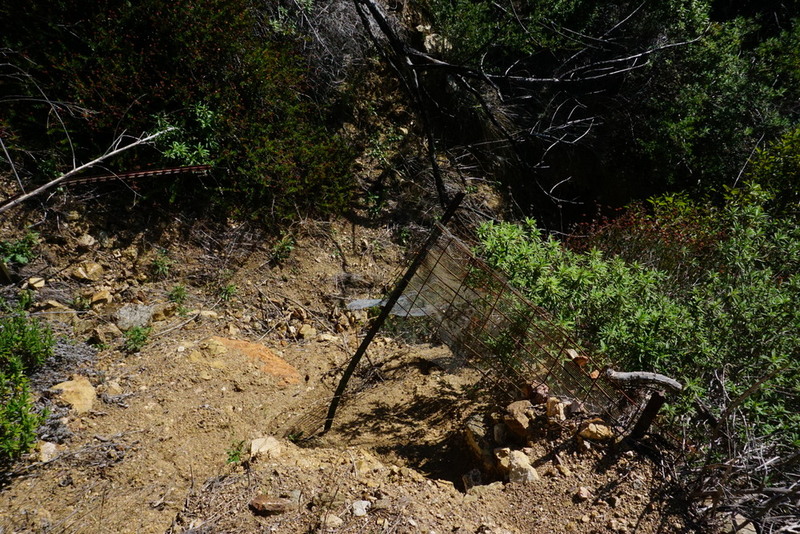 Most of this section has held up extremely well, and only a few places will require rock-armoring and/or drainage restoration. 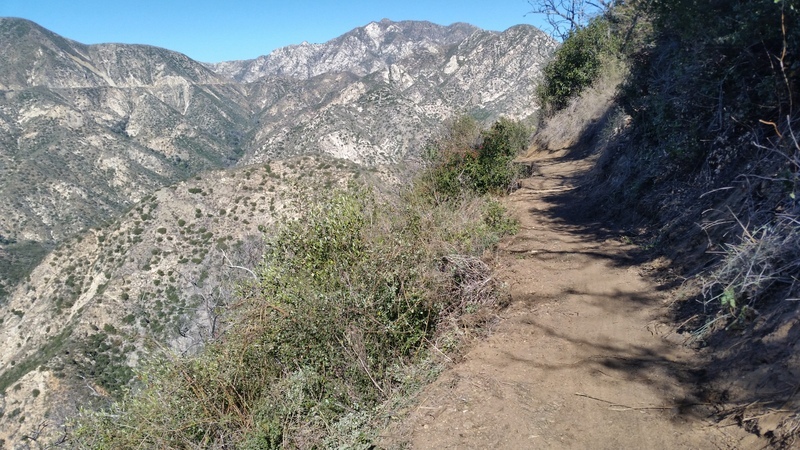 We took the opportunity to scout and flag the next half mile of trail beyond that, identifying the original trail in places where animals and unauthorized trail users–it is still a closed trail–had created unsustainably steep bypasses around heavy brush and a some rock slides. 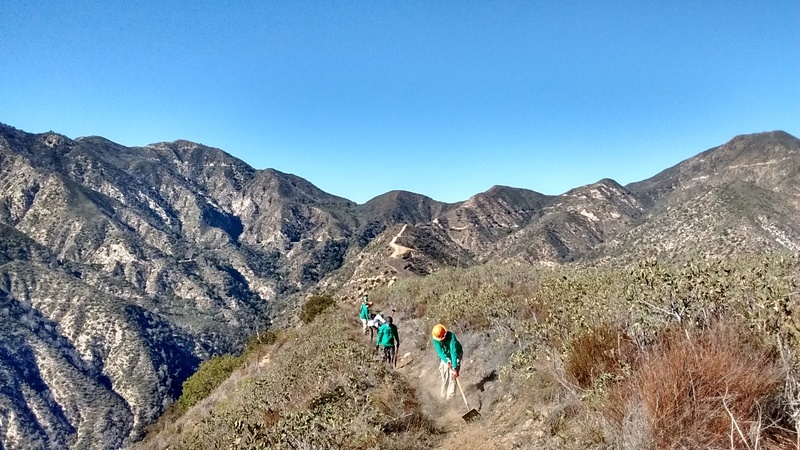 Our next trailwork days, tentatively scheduled for February 7, and February 21 (with MWBA) we’ll concentrate on tread work for the section we cleared of brush today. 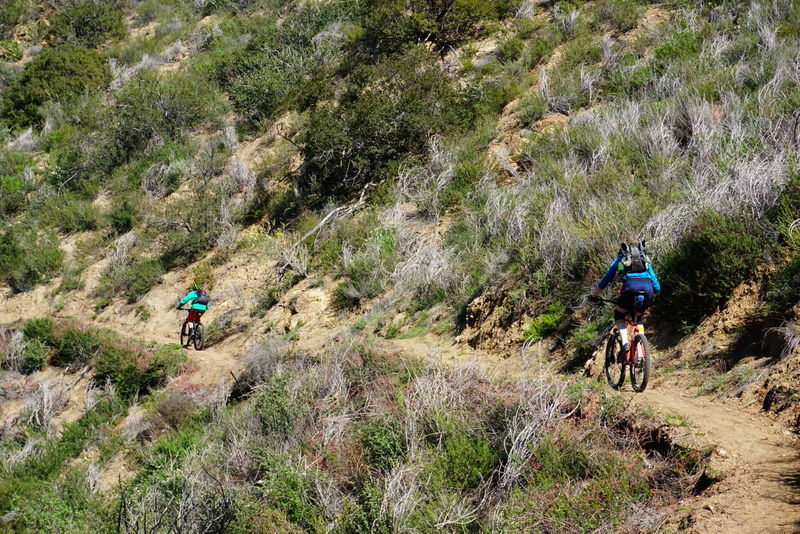 There are no major problem spots along this section. 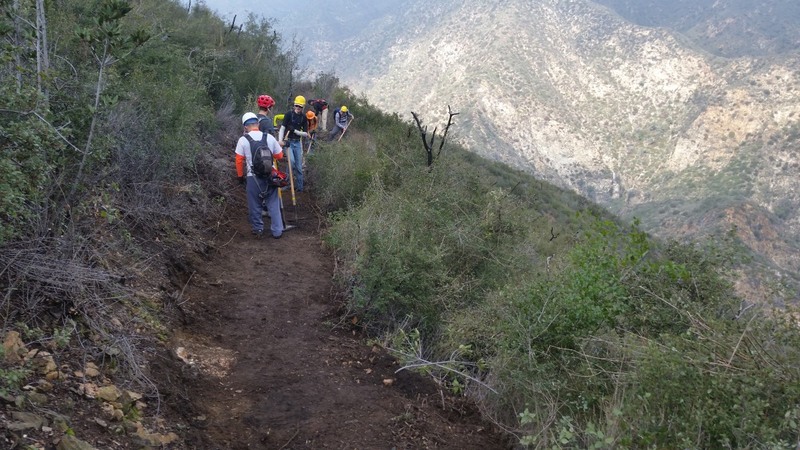 We’ll also continue brushing the trail beyond there to re-establish the trail corridor and better see the condition of the tread. 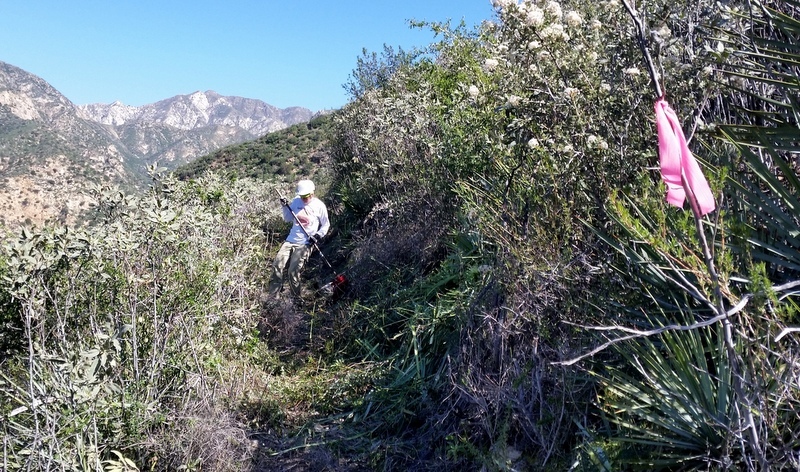 In some sections we scouted, the brush was so thick that there was no way through, forcing us either up the slope or down the slope to get around the brush and back on the remnants of trail tread. The biggest problem section will be at the 16th switchback. 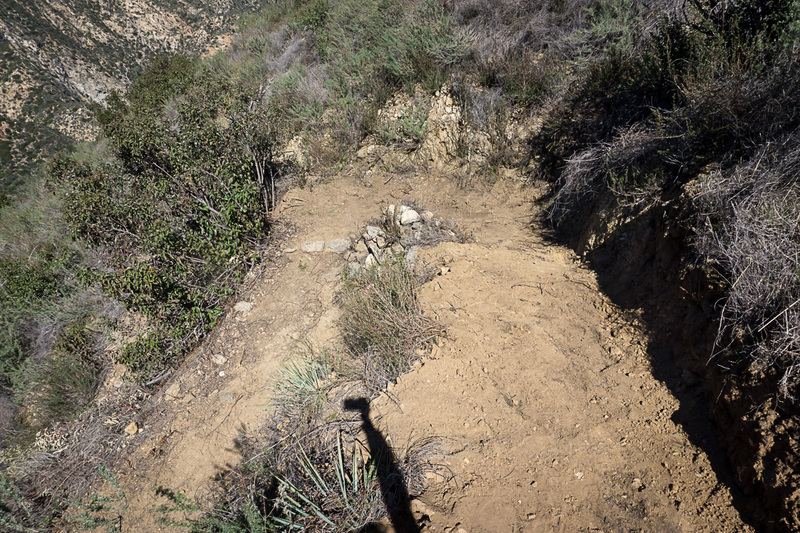 Here the switchback itself has been washed away, and we’ll need to do extensive rock work to make the section sustainable and rideable. 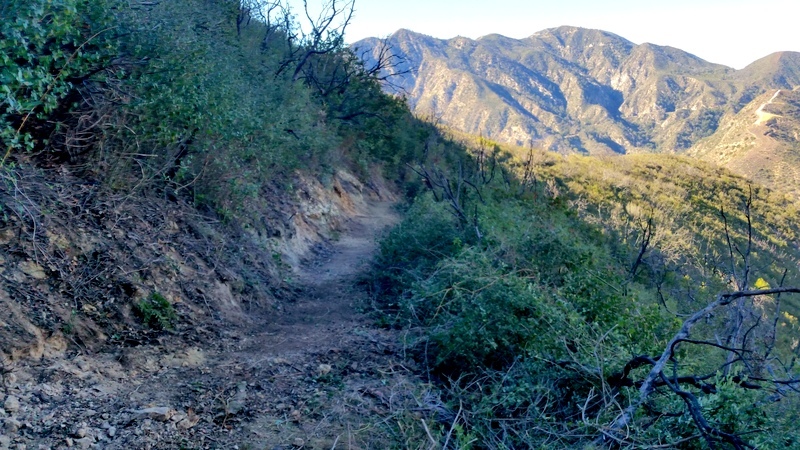 Much of the area is soft, loose dirt, and the trail is completely filled with brush, slough and debris. 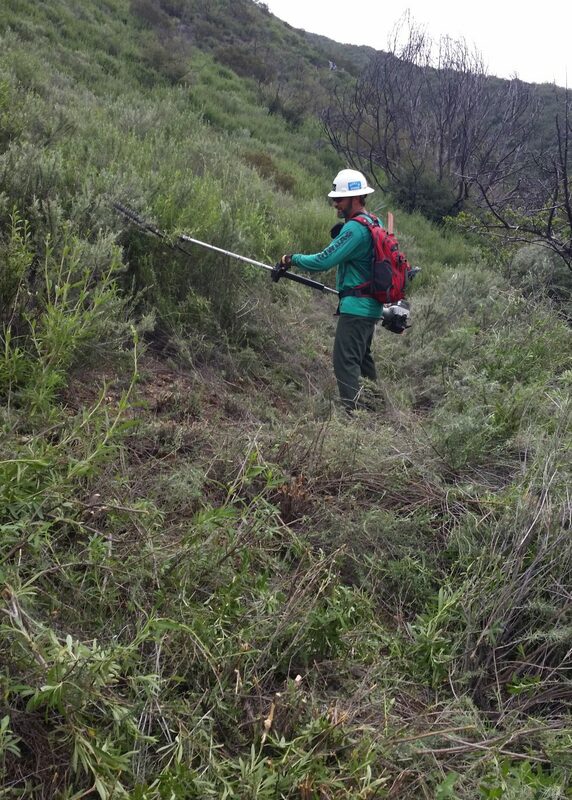 Nothing our dedicated volunteers can’t handle! After today’s work, those volunteers who still had time were treated to lunch at a local restaurant. 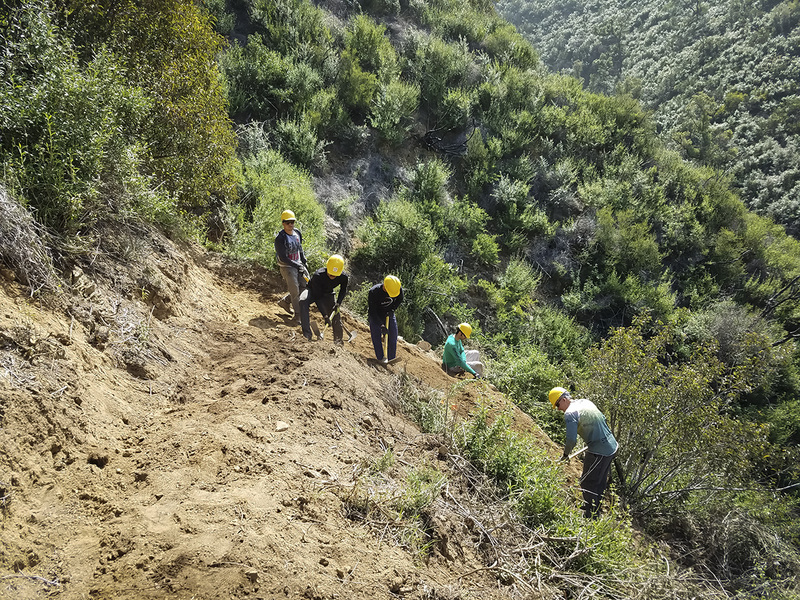 It is the dedication of these volunteers, many of whom have come out every trailwork day we’ve scheduled, that allows us to keep pushing forward to complete the trail. Major kudos to all of you who have contributed! January 10, 2016 was another extremely productive day for the Ken Burton Trail Restoration project. With recent storms, it was reassuring to see our of work holding up perfectly well. In fact, the restored sections of Ken Burton fared better than the Upper Brown Mountain fire road, which was rutted and much more rocky than before the storms. 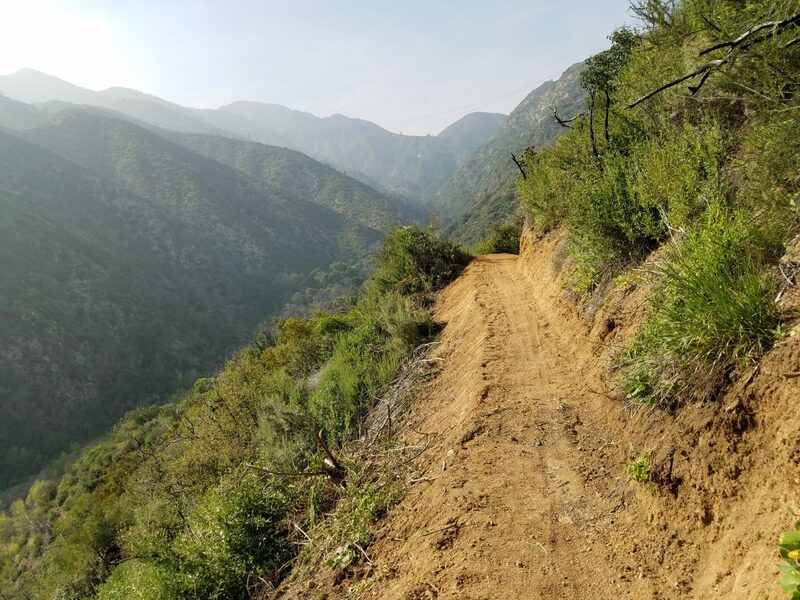 Once again teaming up with the Mount Wilson Bicycling Association, 21 volunteers were able to do a first-pass cutting brush on 0.3 miles of trail, with tread restoration completed on 0.2 miles of that. Matt Lay, of MWBA led the effort to complete the first wire basket retaining wall. 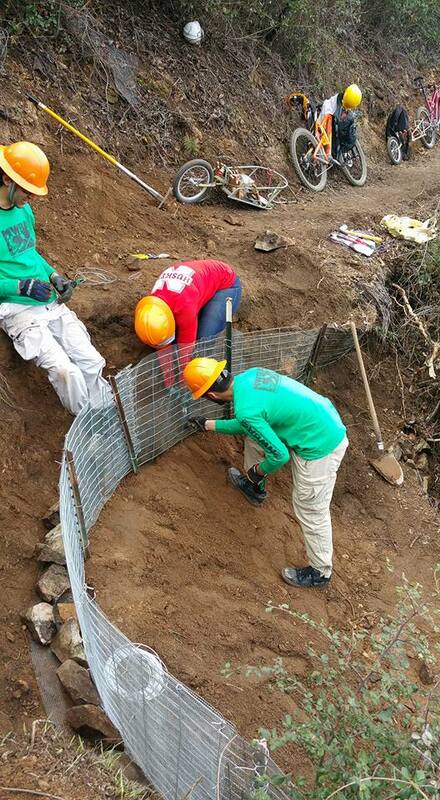 At our last day, the lower retaining wall was completed. The upper wall is almost complete, needing a few more hours of work. 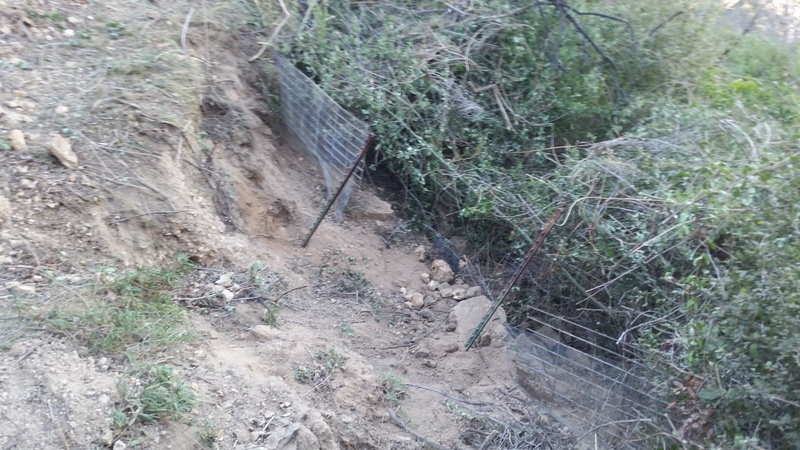 There are two more retaining wall sections that will need similar rebuilding. 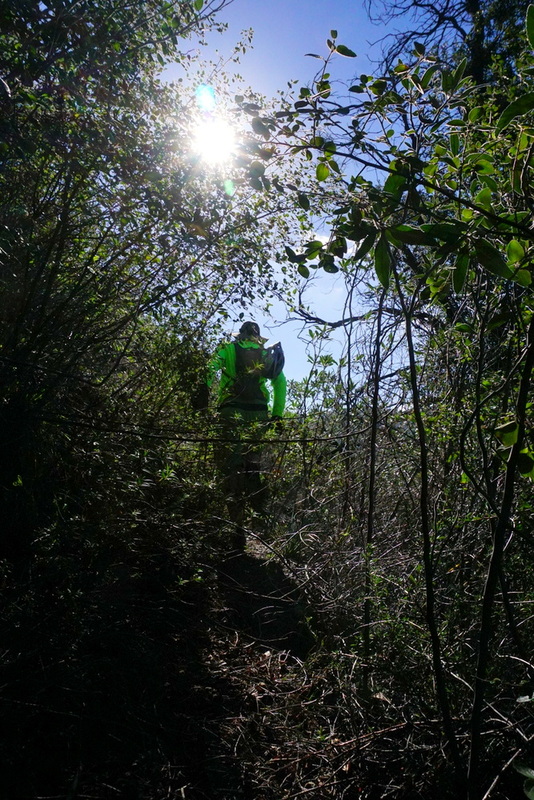 We were blessed with perfect trailwork conditions. Rain was in the forecast for the night before our event, with most forecasts showing the weather tapering off by morning. 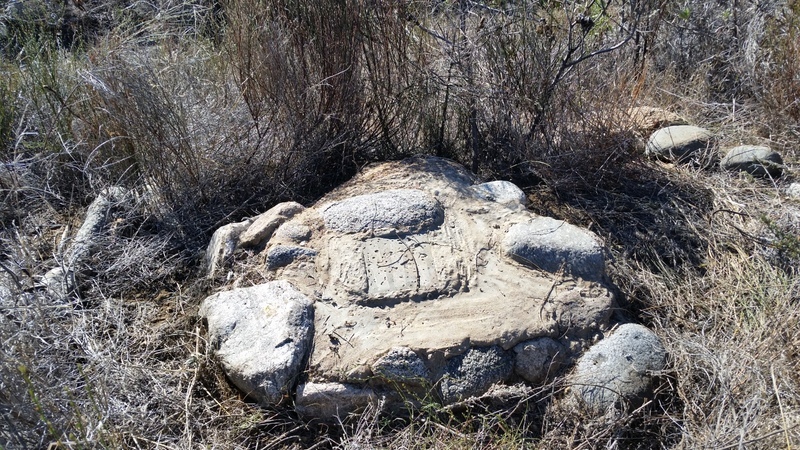 That’s exactly what we had: nice damp soil, and cool, comfortable work conditions. The day before the scheduled trailwork, I took a load of tools up via bob trailer, and did a walk-through video of the section we were to work on. 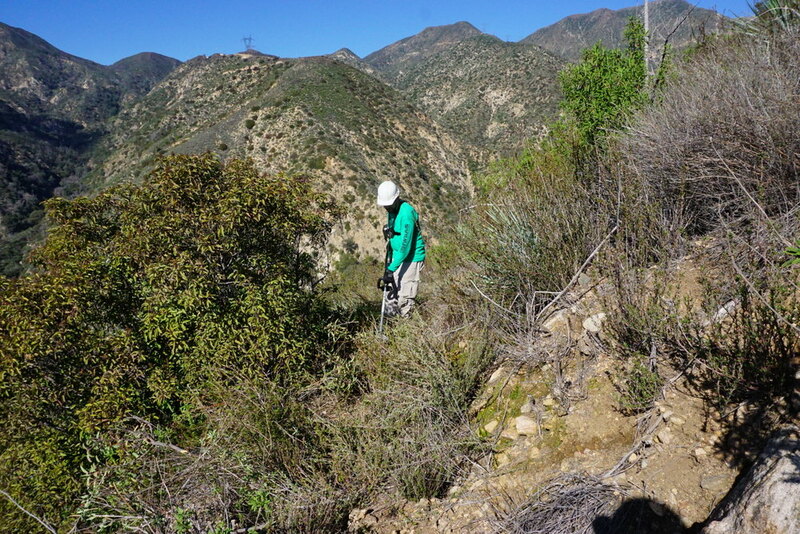 After the trailwork day was completed, I repeated the video walk-through. The before and after videos show what an amazing transformation is possible. The two videos are embedded below. 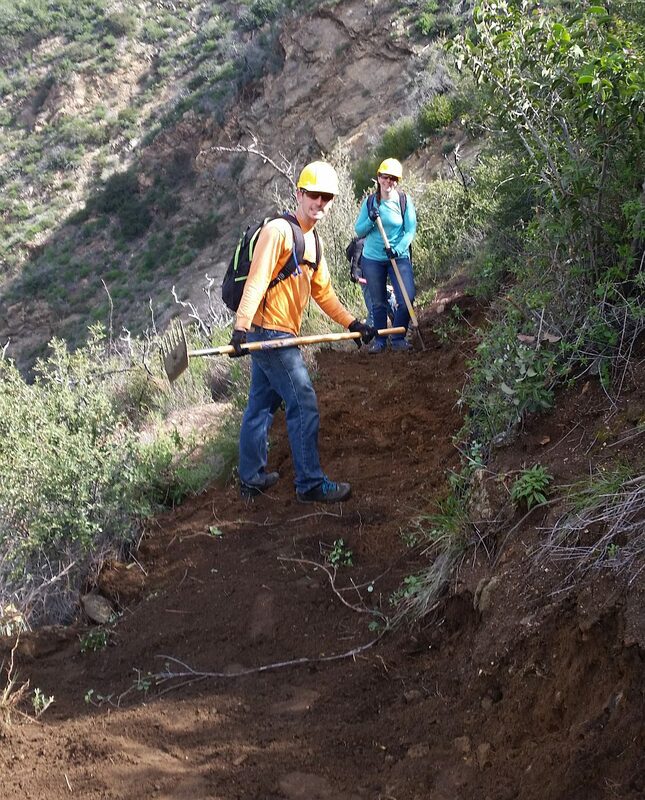 We also have to thank Pat Phillips, a long-time trailwork volunteer and supporter who helped build the trail in the 90s. He graciously hosted us once again for lunch after the day’s work. 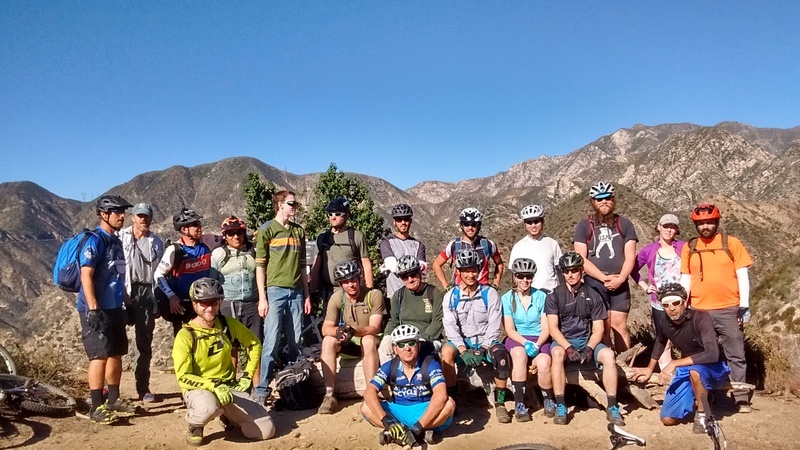 Mount Wilson Bicycling Association will be hosting the next trailwork day on Ken Burton this coming Sunday, January 17. and CORBA will host again on January 24 (both dates are weather-permitting). 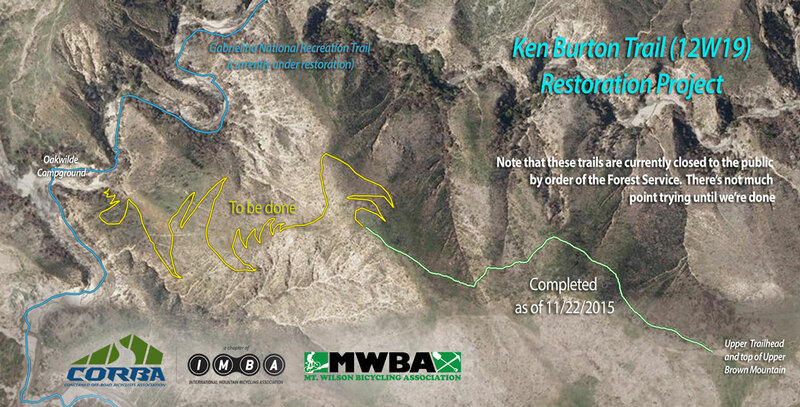 We all want to see this trail restored and opened! 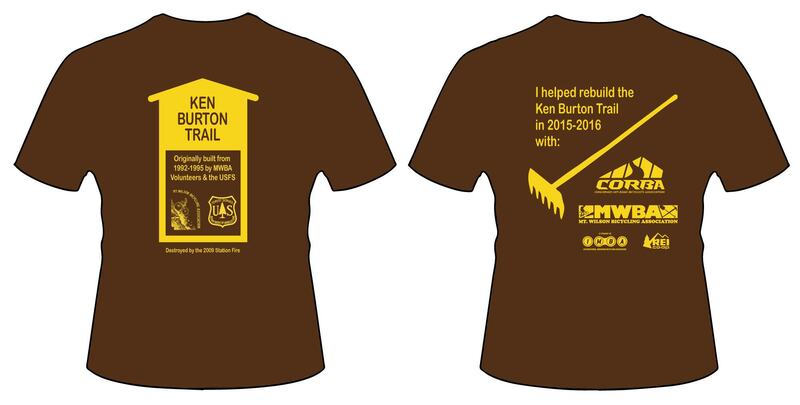 Thanks once again to the tremendous volunteers for their hard work and dedication. Ahead, brush. 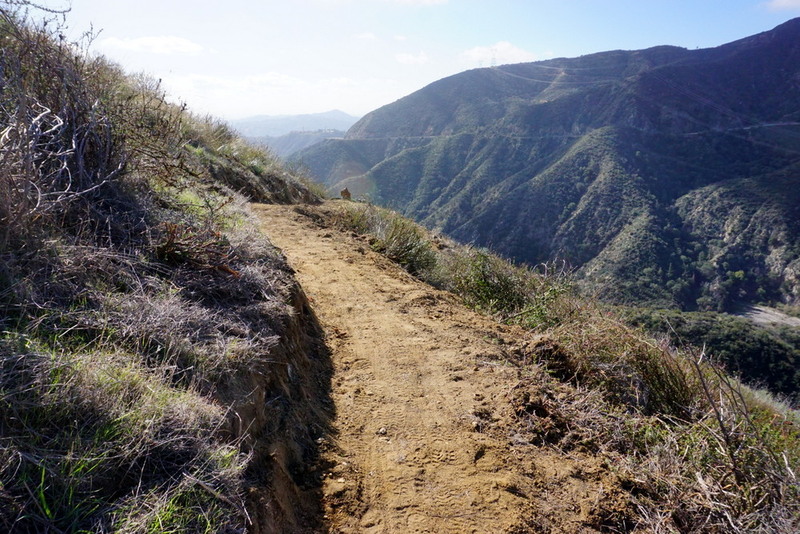 Behind, a trail.